Yikes how long since I blogged? 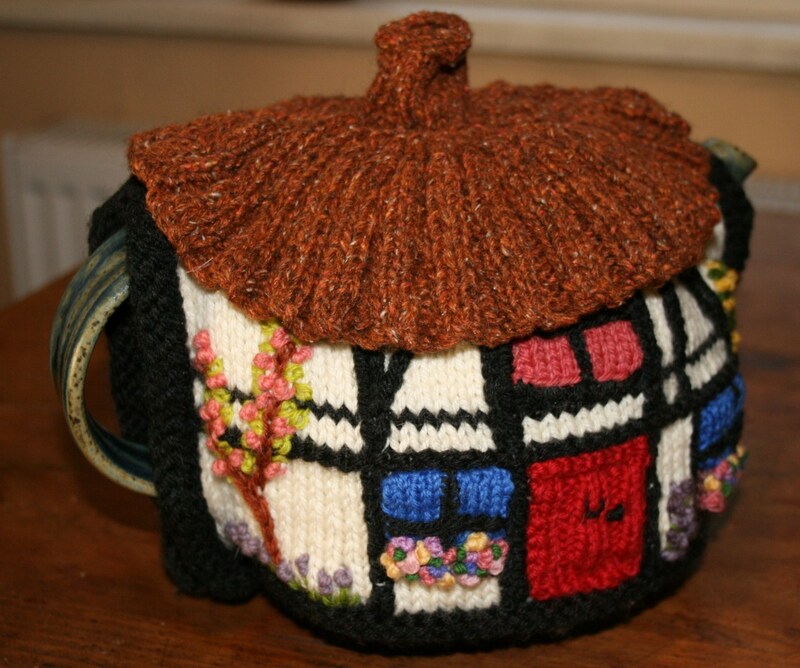 I thought I’d spend a little time sharing some of my knitting from last year. It’s that time when we look back and review and look forward and plan, and if you’re like me desperately try to find the one strategy that will allow you to be more organised! 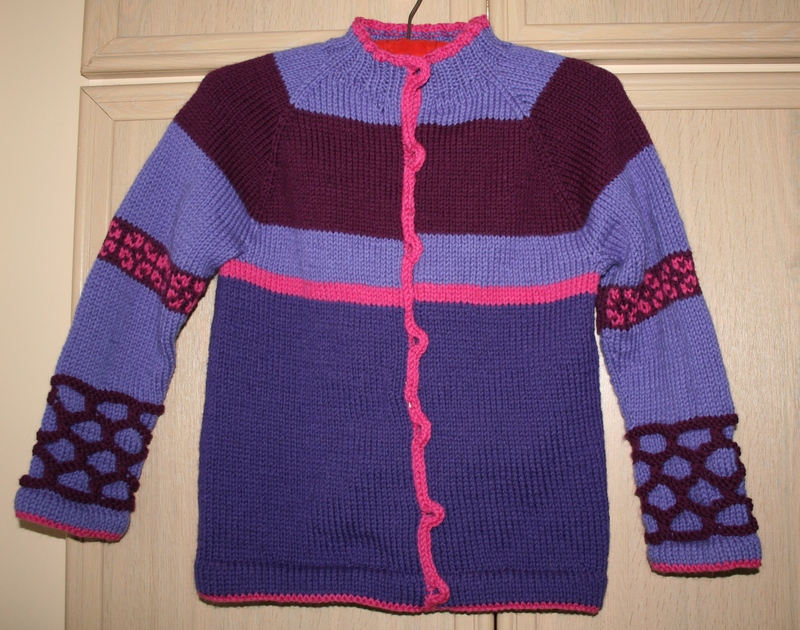 So to look back I went to my Ravelry Projects page to look at the year’s knitting, only to realised that a lot of it didn’t make it on to my the page – so I went off to try and resolve that issue. I also realised that despite feeling like I knit more and more, this year really was impacted by the house move and subsequent DIY schedule that has eaten into weekends and evenings. But the highlights? 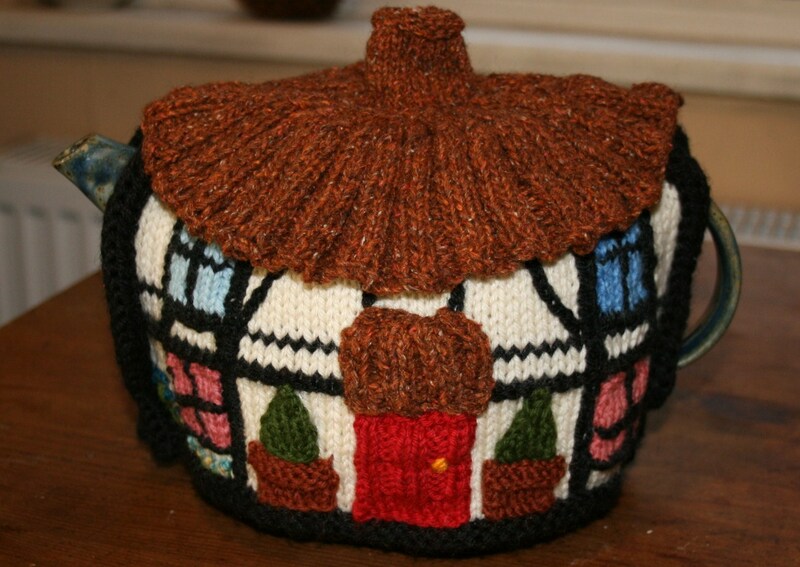 I agreed to knit this as a commission to raise funds for the Blackpool Knitting Group to help towards the cost of the bus to Harrogate for the Knitting and Stitching Show. It wasn’t a pattern I’d have chosen for myself and the pattern itself had a few problems and needed some substantial alterations. There were also all the fiddly details and embellishments that meant it took a lot of self discipline to stick with it. But it was finished and handed over on the town hall steps in a manner that looked not unlike a quick drug deal and the recipient was thrilled. Indeed her enthusiasm for it made up for all that french knotting and duplicate stitching. 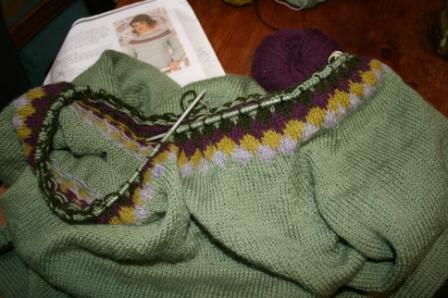 I loved this pattern the minute I saw it in Susan Crawford‘s A Stitch in Time Vol. 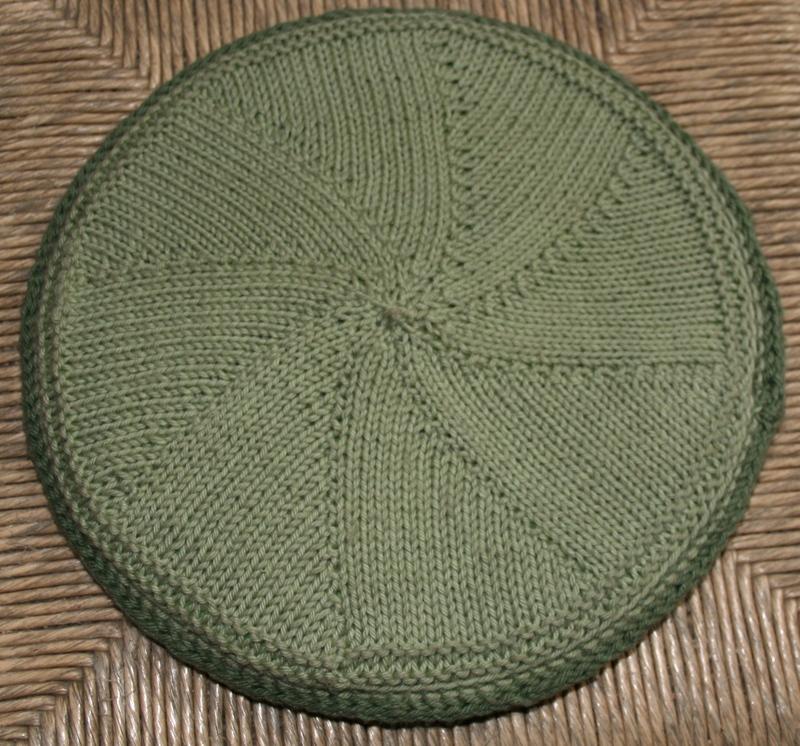 2, and bought the Excelana Yarn at the Harrogate Knitting and Stitching Show 2011. The yarn is a absolute joy to knit with – it has a wonderful hand. 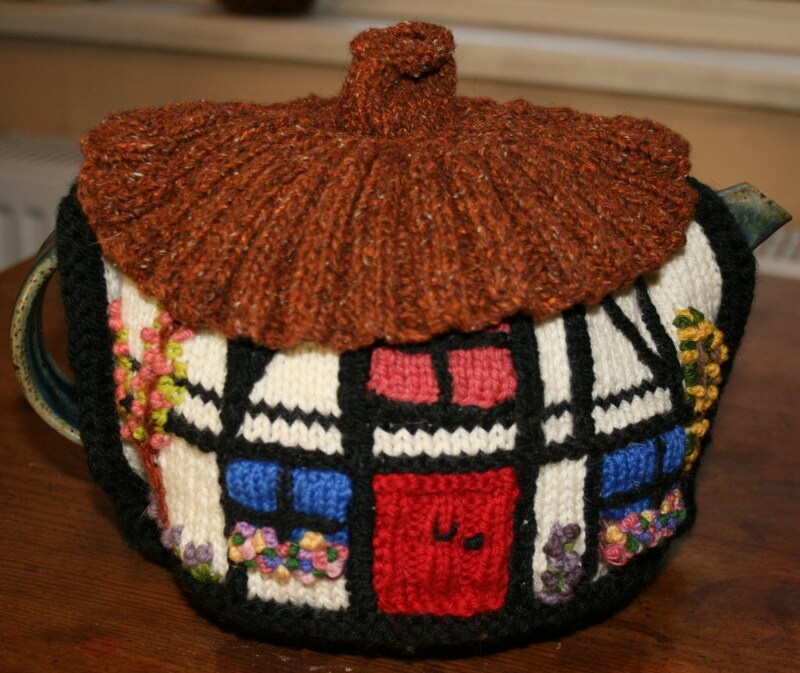 The stitch definition is also amazing as are its thermal qualities. 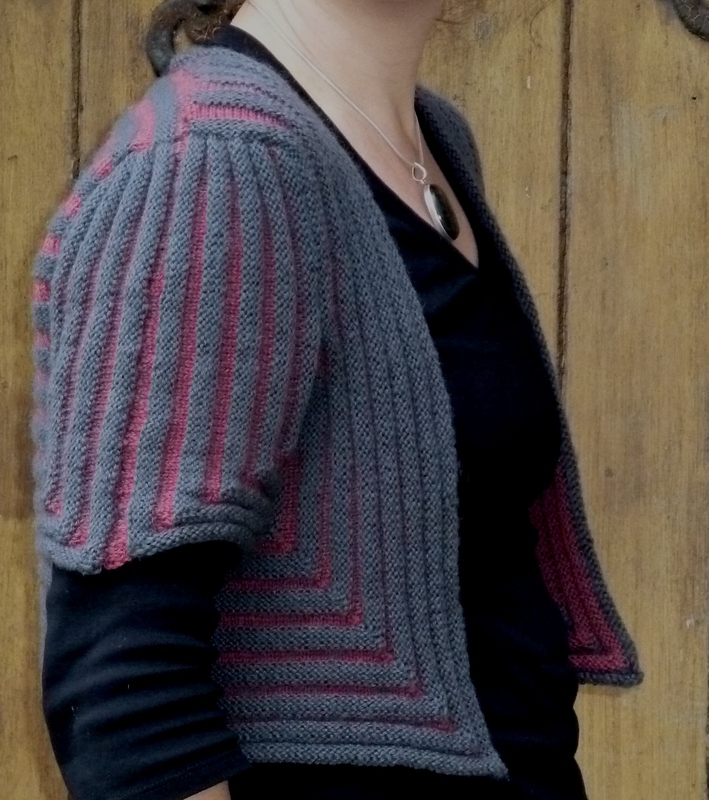 Just a short bolero, it’s surprisingly warm and always garners compliments. The top is the Corona pattern and bottom is the Burst pattern. Inside is a piece of carpet underlay sandwiched between two discs of green felt and lightly stitched together around the edge. 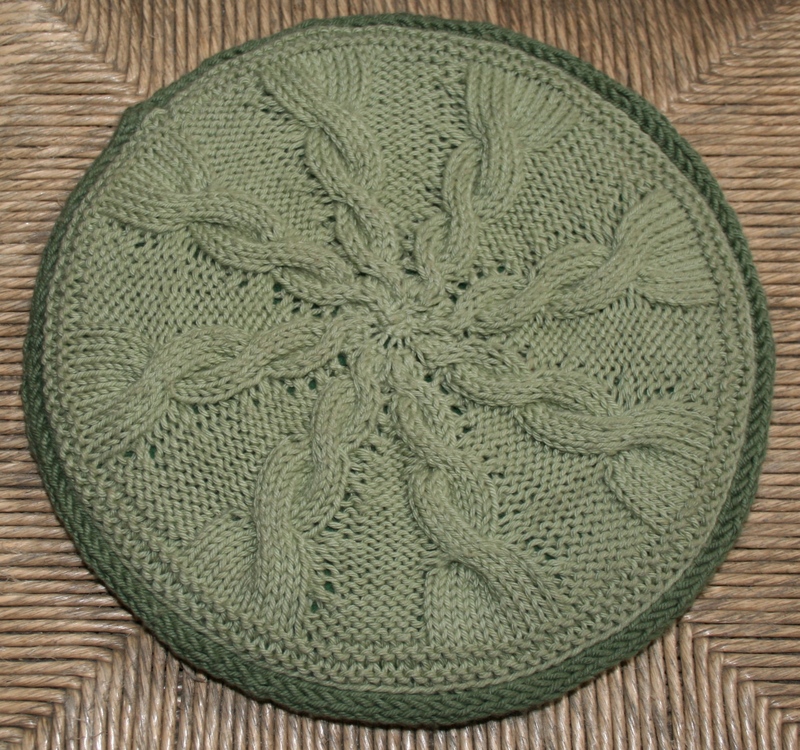 I then placed the two knitted circles together and picked up and knitted around the edge in the cast off stitches – just the two halves of the cast of stitch that were nearest each other – with the darker green cotton. Then I cast off these stitches using an I-cord cast off. I was pretty pleased with the results and so were the recipients and I plan to make a second for our next visit. 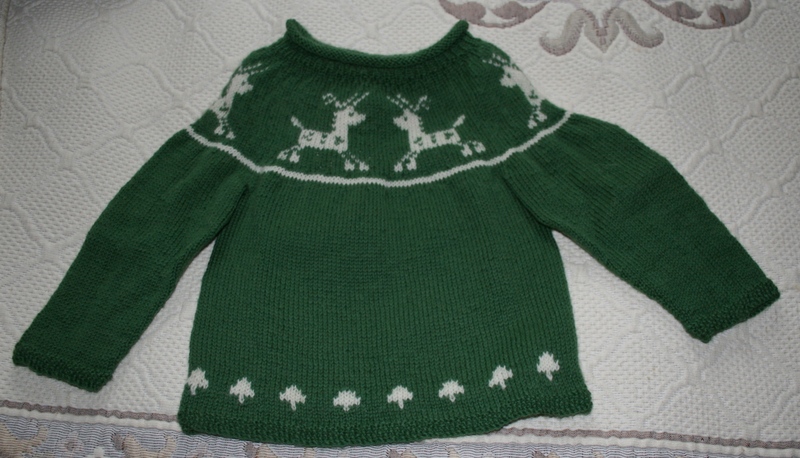 This was a rather late decision and thank goodness it was knitted in Cascade 220 worsted yarn. Again the sleeves are done first and the body was cast on as we headed down to Dorset on the 23rd. It was completed at approx 11.30pm om Christmas Day ‘ready’ for gift giving on Boxing Day. I say ‘ready’ because I left the buttons behind, they’re now on their way to my Mum in the post to be sewn on and Em is already wearing her jacket . 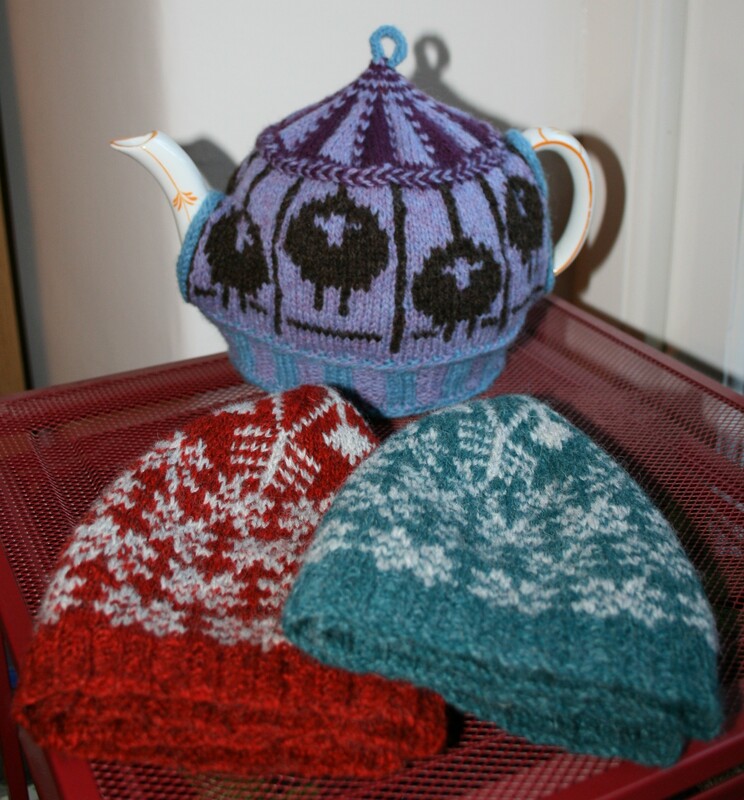 Here we have a Sheep Carousel teacosy and 2 Snawheids. 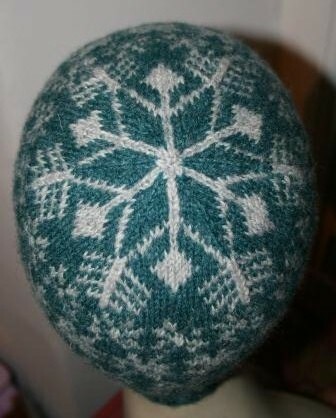 I loved the Snawheid pattern especially. 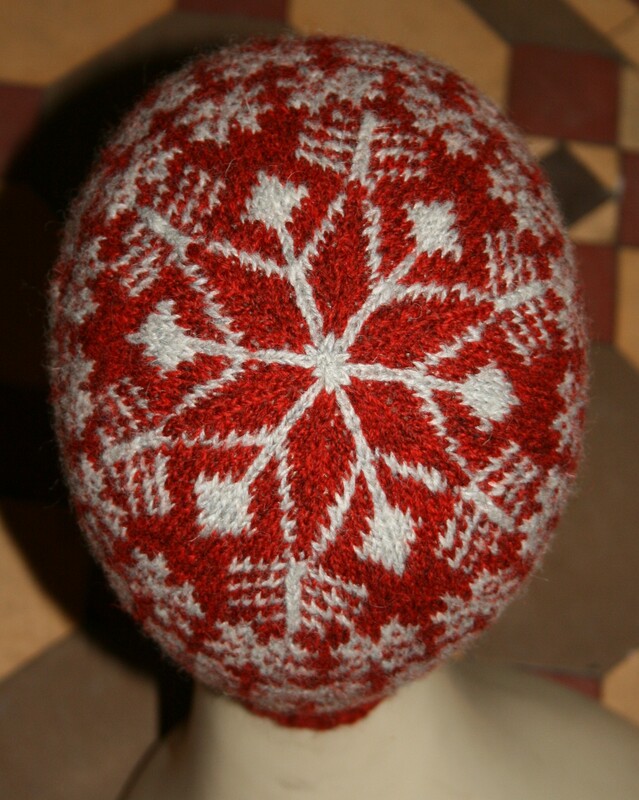 It’s perfect for last minute gift knitting as it knits up so quickly and I love the crown pattern, perfect for the snowy weather we’ve had.